This time, learn how to make a variation of the famous puto—buttered puto. Here’s an easy and fast business idea. Without a doubt, puto is still among the popular rice cakes in the country. Do not be surprised to find several variations of it as many Filipinos love to experiment to add more excitement to their tried and tested recipes. If you are into making and selling puto, you may try making buttered puto this time. It is a variation of the popular steamed rice cake, which is most ideally served during breakfast, paired with either hot chocolate or coffee. Of course, it could still be enjoyed with the famous dinuguan (pork blood stew). Take note that in this recipe, ordinary flour is used rather than the traditional galapong or ground rice. Thus, this one requires less preparation and is usually made faster, without much hassle. 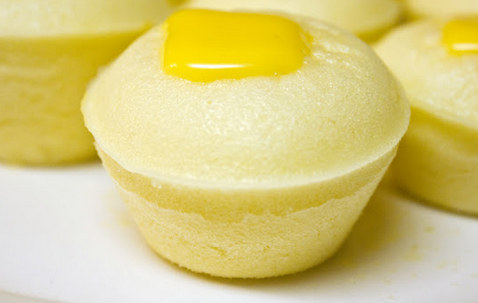 Buttered puto is also usually in smaller sizes compared to traditional puto. 1. Combine flour, baking powder, and sugar in a mixing bowl. Mix well until an even consistency in powder is achieved. 2. Add melted butter, evaporated milk, water, egg, and dissolved pandan essence. Continue mixing thoroughly until the mixture thickens. 3. Pour it into plastic molds (commercially available). 4. Put a small slice of cheese on top of each mold. 5. Boil water in a steamer. Steam the molds containing the mixed ingredients for about 20 minutes or until puto is cooked. 6. Remove all molds from the steamer and set aside to let those cool down. 7. Remove puto from molds and arrange in a serving plate or put into boxes if you would sell those directly to customers.